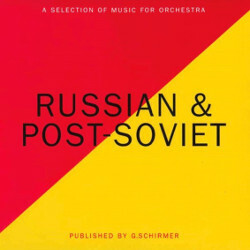 From iconic composers Dmitri Kabalevsky, Aram Khachaturian, Arvo Pärt, Sergei Prokofiev, Igor Stravinsky, Dmitri Shostakovich, Alfred Schnittke, and Sofia Gubaidulina, this playlist celebrates the vast range of major Russian composers of the past and the present. This vast repertoire of symphonies, concertos, and suites continues to be embraced, not only by the Bolshoi and Mariinsky Theatre, but all around the world with twentieth-century classics such as Rodion Shchedrin's Carmen Suite, Khachaturian's epic Spartacus, Prokofiev's Romeo & Juliet and Cinderella, Stravinsky's Les Noces and Shostakovich's Concerto for Piano No. 2. Delve into our vast catalogue with this carefully curated selection to enjoy lesser-known gems such as Giya Kancheli's Styx and Lepo Sumera's Symphony No.2 and enjoy this celebration of defining artistic voices!